Look out upon New England’s beauty through the panoramic views offered by bow and bay windows. Add character and space to your rooms by bringing the outside in through large glass panes. Add a seat to the bow or bay window to expand room for company or to curl up in to enjoy the day. Bow and Bay windows grace homes throughout Rhode Island and Massachusetts, adding an eye-catching architectural feature to an otherwise uninspiring exterior. As a company that specializes in window replacement for Massachusetts and Rhode Island homes, we at Renewal by Andersen of Southeastern MA and RI are deeply experience in the design and installation of bow and bay windows. Choose from one of our four models listed below. To learn the full details of each model and if they are right for you, give us a call or fill out our request a quote form to schedule a free in-home consultation. 400 Series Casement Bay: Expand your view from any point in the room. This model can easily replace any flat window avoiding major remodeling while drastically changing the dynamic of your interior. 400 Series Casement Bow: Gentle curves add character to your home inside and out. Welcome light to gently brighten any room. Open the casement style windows to catch the wind at the right angle to freshen your den or parlor. 400 Series Woodwright Double Hung: Add and old world air to your room with this model. The double hung windows allow easy cleaning while enjoying the panoramic view expected of a bow window. 400 Series Tilt-Wash Double Hung: The tilt-wash feature allows for the lowest maintenance available. Energy efficiency is never an issue with this style of window; breathe the clean air casually wafting in or relax as snow falls while you watch at your leisure. 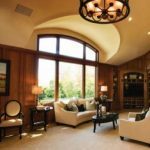 If you need a spacious atmosphere to your interior, select a bow or bay window. Here at Renewal by Andersen of Southeastern Mass and Rhode Island, our replacement windows will show you a view unmatched by standard flat windows. When autumn comes and the leaves change to bright reds, oranges, and yellows, you can take in the vibrant hues as you pass. As with all of our windows, Renewal bow and bay windows are backed by either a 10-year or 20-year limited lifetime warranty. Just another perk of being our regions premiere, fully certified Renewal by Andersen contractor. To learn more about window replacement for RI and MA homes, give us a call or fill out our request a quote form to schedule a free in-home consultation with our local window experts.